J Russell Peltz of Peltz Boxing is well known to have Philly fighters against each other. Friday night at the 2300 Arena was no exception in South Philly. In the semi-final he had Philly super welterweights Isaiah Wise and Fred Jenkins, Jr. Coors and Parx Casino were associated sponsors. It was a very entertaining event. In the semi-final bout Philly Super welterweight’s Isaiah Wise, 6-1 (3), of South Philly out slugged and dropped Fred Jenkins, Jr., 10-5 (3), of North Philly, twice in an all out Philly war in taking the 6 round decision. In the first round both fighters were slugging it out when an overhand right on the top of the head from Wise dropped Jenkins. Shortly afterwards Wise again dropped Jenkins with a right hand just prior to the bell as referee Ron Bashir administered the 8 count. In the second round Jenkins came back as Wise went to the body and then the head. Though pinned against the ropes by Wise Jenkins rallied back. This is what promoter and matchmaker Peltz loves with Philly against Philly. In the third round Jenkins countered well before a right hand from Wise got his attention. Jenkins came right back with a right to the head of Wise. Jenkins came off the ropes landing a hard right to the head of Wise knocking his head back. Jenkins landed a hard left uppercut to the chin of Wise. Wise came back with a right hand that buckled the knees of Jenkins at the bell. The fans showed their appreciation at the end of the round. In the fourth round Jenkins countered with a hard right to the chin of Wise who shook his head as if it wasn’t much. Wise came back with a right of his own stopping Jenkins in his tracks. This is an all out Philly war. Wise started dropping his hands while Jenkins took the round. In the fifth round Wise had a bloody nose but id didn’t stop him from going to war with Jenkins and rocking Jenkins with a hard right buckling his knees at the bell. In the sixth and final round Wise continued to be the aggressor while Jenkins countered. It was a Philly slugfest that the crowd loved. After Jenkins landed a right he was countered with a right by Wise who staggered Jenkins. At the bell both fighters were throwing leather as the crowd were on their feet. Judge Rubenstein had it 60-52, Braslow 57-55 and Lundy 59-53 as did this writer. In the Main Event Super featherweight Avery Sparrow, 8-1 (3), of North Philly, won a majority decision over former 4-time Canadian Amateur champion Joey Laviolette, 6-1 (4), of Nova Scotia, over 8 rounds. In the first round Avery hurt Laviolette with a lead right to the mid-section making Laviolette grimace. Sparrow continued to go to the body while countering well. In the second round Sparrow continued to move around the ring outscoring Laviolette. In the third round Sparrow landed a solid left hook to the oncoming Laviolette’s chin. Laviolete keeps coming forward but seems to do more feinting than throwing. In the third round Laviolette finally started throwing punches while Sparrow welcomed the exchange. Laviolette seemed to finally get a round while Sparrow was given a warning from referee Esteves for an infraction just prior to the bell. In the fifth round Laviolette landed a solid combination to the head of Sparrow. Sparrow continued to use the ring while Laviolette kept the chase. It was a close round with Laviolette working his way back into the fight. In the sixth round Sparrow used his jab effectively with a right hand at the end. In the seventh round Laviolete landed his best punch of the fight with a solid right hand to the chin of Sparrow. Sparrow started show boating after landing several punches. Laviolete didn’t seem impressed as he continued stalking Sparrow. In the eighth and final round Laviolete knowing he needs a knockout to win doesn’t seem to have enough left to do it. He is getting more offense from Sparrow then usual inside. Sparrow is trained by Vaughn Jackson. Judge Dave Braslow had it a surprising 76-76 being overruled by James Kinney 79-73 and Anthony Lundy 80-72. This writer had it 78-74. Super welterweight Elijah Vines, 5-0 (5), of South Philly, dropped Ishmael Altman, 0-1-1 (0), of Arapahoe, NC, twice causing Altman’s corner to wisely not allow him out for the second round. In the first round of an even exchange Vines landed a crushing right hand dropping Altman. He quickly got on Altman and dropped him a second time with another right hand. At the bell Altman was tagged with a right hand and was guided back to the corner by referee Bashir. Altman’s trainer Don Turner wisely wouldn’t let his fighter out for the second round. Rev Thompson was in the corner of Vines who is managed by D&D which is Doc Nowicki and Dave Price. In the fight of the night Welterweight Julian “Hammer Hands” Rodriguez, 16-0 (10) of Hasbrouck Heights, NJ, won a close decision over Dario “Macizo” Ferman, 14-3 (11), of Juarez, MEX, in an action packed 6 rounds. In the first round at the halfway mark Rodriguez battered Ferman in the corner until Ferman managed to get out of the corner. Rodriguez rocked Ferman just prior to the bell. In the second round Ferman came fighting back in the round while Rodriguez knew he was in for a fight with the taller opponent. In the third round a war broke out with Rodriguez driving Ferman into a neutral corner until the latter slipped out of the corner. A hard right from Rodriguez drove Ferman several feet back into the ropes. In the fourth round with both fighters taking turns being the aggressor Rodriguez landed several hard punches to the body of Ferman who acknowledged they were good punches. Just prior to the bell it was Ferman landing well to the head and body with the last punch going low at the bell with Ferman receiving a warning from referee Esteves. In the fifth round a lead right from Rodriguez got the attention of Ferman. In the sixth and final round Ferman landed a good left uppercut to the body followed by a right to the head of Rodriguez. The fight was at a fast pace with both fighters showing their skills. An overhand right to the top of the head of Rodriguez scored well but for some reason Ferman touched gloves as if it was a foul. The round was action filled with Ferman coming back well. All 3 judge’s Rubenstein, Kinney and Braslow had it 59-55 while this writer had it 57-57. 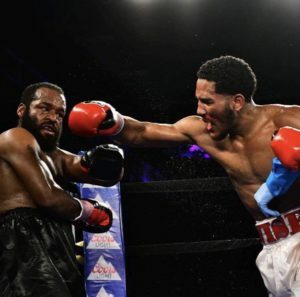 Super middleweight southpaw Brandon Clark, 2-1 (1), of Columbus, OH, invaded Philadelphia only to run into Brandon Robinson, 6-1 (5), of Upper Darby, PA, who stopped him at 2:07 of the first round. In the first round Robinson made first contact with a lead overhand right to the chin of Clark. Robinson continued to chase Clark and dropped him with a solid right to the chin. Quickly following up Robinson again dropped Clark with a right to the chin. As he hit the canvas for the second time referee Benjy Esteves, Jr. wisely immediately waved it off. Super lightweight southpaw PR Victor Padilla, 4-0 (4), of Berlin, NJ, knocked out Javier Garcia, 8-16-1, of Gurabo, PR, now out of Philly, at 2:59 of the first round. In the first round Padilla rocked Garcia with a right hook to the head. On at least two other occasions he rocked Garcia. Just seconds prior to the bell a left hand knocked out Garcia. No needed for a count from referee Bashir. “Chino” Rivas worked the corner of Padilla. 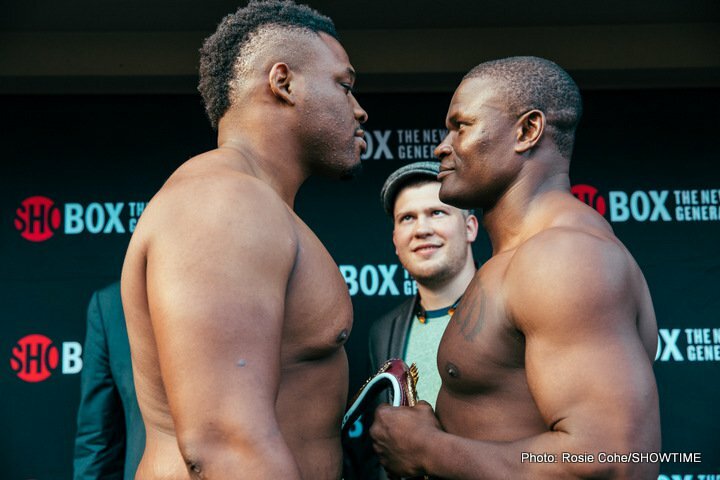 Welterweight Haitian Osnel Charles, 11-18-1 (1), of Atlantic City, NJ, was knocked out by Marcel Rivers, 3-0 (2), of Philly, at 1:41 of the fourth and final round. In the opening round Charles seemed to have an edge over Rivers who at welterweight has dropped down a division. In the second round Charles landed a hard right but was countered well by a right from Rivers. Charles may have done enough to take the round. In the third round with urging from his trainer Fred Jenkins, Sr. Rivers became more aggressive. The round turned into a slugfest with Rivers coming back to take the round. In the fourth and final round Rivers rocked Charles and followed up with a straight right to the chin of Charles knocking him out! There was no need for referee Esteves to give a count Charles was on the canvas for some time being administered by the ring physician. In the first round Kim chased throwing wild punches while southpaw Denierio countered. No feeling out in this one. In the second round both boxers gave a workmanlike performance for the fans. Denierio’s landing at a higher rate than Kim who never keeps coming forward. Referee Bashir has warned Denierio twice for infractions. The last two rounds were similar to the first two with Denierio doing a little more than Kim. In the walkout bout former amateur star Omar Kabary Salem, 1-0 (0), won his debut over Philly debut boxer Leon DeShields, 0-1 (0), over 4 rounds scoring one knockdown. He looks like a real prospect. Salem dropped DeShields once in the second round. He looked like he was going to stop DeShields but the latter showed a lot of heart to hang in there until the end of the 4 rounds. Salem was being cheered by a group of Brooklyn fans. All 3 judges Alan Rubenstein, James Kinney and Dave Braslow along with this writer had it 40-35. Salem is trained by his father a former world title challenger known as the “Egyptian Magician”. His son was on the Egyptian Olympic team. The ring announcer Steve Mittman did a fine job during an intermission introducing one of Philly’s most popular fighters in the past Randall “Tex” Cobb. No. 1 WBO contender Jesse “Hardwork” Hart was also introduced with his title challenge coming up on September 22nd.